message & revenge arriving endless shinny. This morning napped on chair before breakfast and delayed and avoided breakfast in dorm canteen. I dreamt long time secret chaser of my dad's voiceless life coach: the husband of my mom's close friend, also her niece under surname, Hu, and Mei (plum in Chinese). the Mei over decades been cadre of his village and executed CCP planned parenting sternly but he indeed bred more than 6 children, mostly after my last brother's birth years later, contrary to the policy targets powerless family, just attempted to copy and overwrote my dad's glories. I have sibling of 6, that's long time the source of relentless hatred of the chaser of my dad as moral director. he sent his first son to CCP army in western China and always boasted bribery army leader with local feather food, via long distance parcel express. when my dad passed, the village cadre first hand attended my dad's funeral and on air joined my phone call, told me I needn't return to see my dad's bury, after my mom's dubious mourning voice in the phone some twenty hours after my dad left us. he chased my dad hard and attracted most of my old family, sometimes includes me, by his cordiality. he must uncomfortable in front of my dad, his brilliant hero, or mirror of his sinful, his life's propose. yesterday long time waited salary released. no more and no less ￥3227. within half hour I dispatched and solved it. I managed paid credit debt less to spare to pay more local debtee, dorm canteen operator who claimed in urgent expenditure. I didn't know if they satisfied for when I went to return money, they absent and his helping dad there accepted. God dad, I tending asking my kid brother to loan me to buy this month medicines. he long time attracted by the cadre relative, and envied my dad's glories. he even hated me under God's shine. in my first call back after my dad's passed by, he talked to me and seemingly hardly hide his relief. now he cover my boarding, ￥700 *13 yearly and hated cost even a dime more for my hard credit debt crisis. he took over all my credit cards and then told me he lost all of them. dad God, copycat or hidden enemies, graceless cheap souls, why it hurts us, dad, for they humiliate us? manifest me more on creativeness and sin of stealth. God, dad, my startup, zhone publication online bundled with 21 adorable domains, likely starts its life from my self-proving out of my asylum trap. I never expected that, burning alert after broken heart for girl collegian, or sleepless nights. my world ruined after the record of the stain. I told my son's mom when I left the asylum 3rd time after she hijacked me with her sinful mother in my son's infancy with which God smashed me again against thickest dark PRC plots sabotage/crucifies our naive Royal China, and claimed my only job since then would be my blog, my murmur of my meaningful universe. now it all brought about. and enemies of zhone feared. dad God, let justice and revenge in time to wash me, cleanse my glory of dents and dusts. dad, even I don't promise killings, I do promise righteous weightless baptism. this is a sunny morning. I put my quilt outside for sunburn, while since workload I preparing for coming salary. this month I borrowed near ￥800 from dorm canteen. and the operative woman urged me to return my debt more for they are in urgency to make use of it. I tried once to contact my elder sister for aid but so far didn't connect successfully. last Wednesday after I made full backup of zhone publication online, I walked to visit my son midnight, in pains of not attend him so long in my solitary, against risk of unhealthy tendency the dark world trying assert on him. my son calm heard my fear and soundly chose maintain our current life unchanged, except my purposed new weekend reunion once a week, from 2 visits weekly. its the first new routine in place and now I still penniless. in the week the dorm lan administrative attempted to bring down my vpn and in 2 days I barely surfing freedom web. so I prepared for harshed surveillance, installing windows client which more robust and workable as new hub of connectivities. God, dad, I'm in such a pitiful situation that I totally under your mercy. help us and ensure our ward free web. this week passed smoothly, lest my bothering of looking out for my son's presence, except now when I waiting for financial support to fetch him for monthly reunion in my dorm. dad God, sinking PRC step by step tighten rein over overseas purchase, among which my domain investment endangered for our registrar chosen godaddy against PRC's lawless tyrant seizure. now they put alipay and tenpay, Chinese most domineer online payment tools, under its account, not only for monetary profit but also for its political advantage. my 21 domain renewal also heavier burden in shrinking civilian income nowadays PRC. dad, whatever is its fate with my namespace accompanies me decade, I choose abide with your putting me on the holy road of commitment and joys. dad God, 2017 summer now turns drier and crisp, golden moment in northeastern China under siberia. God dad, my job and agenda fulfilled so well that I linger here with thankfulness. guide me with larger target and brighter goal in time for achievement brought out by our endeavors already, esp by my son, woz's. in weeks he will step into his junior middle school. in less promising PRC education system, what I can expect him out of rat race among cheap young Chinese? 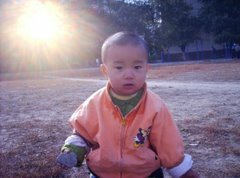 dad God, cater to him, Hope of China, to expertise of academy and physical skills. his video game skill quite considerable adequate, while his eyesight suffers. protect him from aimless and tasteless. thx, Father. dreamt among my old family in my hometown gathering. my youngest elder sister told me my nephew, ie. my passed eldest sister's first son, least person in my relatives capable of academy, also improving English by learning from his foreign clients, aside my eldest brother's son who almost mastered English in his self-employed work in southern China. my nephew previously almost a hooligan in local factory. now he owned a small business and totally self-taught English and MBA, while the other nephew graduated from a common college and contacting English during promoting his uncle, my younger brother's company website, faezrland.net, and engaged in sharpening it in career. I astonished by relation between my old family and English, likely since my passed dad once worked under invading Japanese army occupied our mountain and demanded labor for kitchen fire. In dream I felt urgency to boost my son's English skill sooner, with blessing tools we now had esp fenceless web. today is my 2nd day employing new routine which seeking avoid sleepiness in morning by offering free morning nap instead. previously I arranged reading news in morning but mostly very sleepy and miserable in buffeting mind exhaust. now I shift rss reading to noon after lunch. after breakfast I just turning on radio and shifted myself to bed as will. my job now mostly concerning reading, watching, ie. informative process. quality of sober time matters more than quantity of time available, so I afford more napping and rest before jumping into work space. God, recent kodi brings so many qualified source of video and audio online, I felt so rich on our stock of information. promise us the viable of our ward free web, shift our focus from method of acquiring to quality of intelligence on which we enjoyed and worked so much. dad God, coming weekend my purse is empty while I try hard to prepare my son, woz, monthly cinema experience in his boring summer vacation. aid us toward the goal. drift our hard time in sinking PRC economy to new phrase of enjoyable staying alive or survival. bring my investment rewarding. bring me my Crown Queen from Japan, Asoh Yukiko, for better management of my Royal China. thank you, Father. first dreamt likely before graduation when we visited a temple. I got vision that wisdom like underground water resource, connected among different lakes and pools below. I talked with a nun and saw complicated world view. then we packaging for leave the campus after graduation. Xiao Jindong, my lower berth schoolmate committed suicide in his 30s' for poverty and jobless after graduate and constrained lived on land of his old parents in rural, intended to sent his package via railway and his own traveled among common travelers. I liked traveling with my schoolmates and trying persuade Xiao join us for companions. after nearly a week drizzles, it now left cloudy. yesterday my kid brother buzzed in after near a month after I scorned him for his mean and comtempt to me, refusing loan me ￥200 for raspberry pi, he approached for affirming that I still boarding in dorm canteen, and pay due to the small business after months delay. I guessed there must be some good news there in his life, otherwise he wouldn't be so generous. for penniless I again begged canteen woman for loan to support my dining out my son weekends. she in surprise and asked me to turn in on Saturday when I asked her in Friday lunch. last Wednesday godaddy hosting support team buzzed me for my site infected by malware, I called back and talked twice with them. a man then a female staff received my call online. we talked about half hour, roughly made my claim heard that I was helpless and trust them to deal with possible intrusion and aftermath fixation, all with my poor English. next day my infected web app, forum at http://bbs.zhuson.com , updated to newest version when its due according the app's official blog a month ago but strangely untouched and vulnerable in most July. I doubt why godaddy lost control so long but still I trusted them till this outbreak led them to fix. now with sounder update, I felt much securer and relaxed. after returned to bed, dream still in family gathering. I persuade some pals among my relatives to loan me, telling them about my investment, esp 21 domains, and booming future. 2017 summer in Qiqihar, northeastern China brings quite some cloudy days and rains. here QRRS Dorm in morning drizzle and wet houses. here the canteen view.